On Monday RTD offered free rides on its just-launched Flatiron Flyer bus routes between Denver and Boulder. The transit agency calls the system “bus rapid transit” or BRT, a phrase that’s been diluted with ho-hum projects in the United States. Mexico City, Bogota, Brisbane, and Curitiba in Brazil — these are the cities with BRT systems worth copying. Buses travel in dedicated lanes that don’t mix with general traffic. The boarding process is fast, like rail — you pay before you get on the bus and board at any door, from a platform that’s level with the floor of the bus. Traffic signals hold green lights for approaching buses to minimize time stopped at intersections. Those are the types of features that Denver should put to use on Colfax Avenue. A spoiler: The Flatiron Flyer is not BRT. It lacks almost all of these key elements. Still, it will run much more frequently than the services it replaces, with 4-15 minute headways much of the day instead of a schedule where gaps in between service could stretch up to an hour. The Flatiron Flyer also has some significant upgrades over RTD’s old service, and I wanted to see how the new ride stacks up. I was looking for a few things: the Flyer’s convenience, quickness, punctuality, and comfort. In short, the quality of service. How does it compare to the bus lines it replaced? And will it be good enough to lure people out of their cars? I queued for the 4:20 FF2, the express route with just three stops, in Union Station’s modern underground bus concourse. The gate had an electronic display that clearly conveyed which bus was next and what time it would depart. It was intuitive, and if I missed the bus, I could see that another was coming in 10 minutes, so no worries. (The FF2, one of six routes, comes every 10 minutes but only runs during rush hour.) Boarding was quick only because the trip was free. When RTD starts charging fares, the process will take just as long as on other bus routes. Aside from the lingering new-bus smell, the Flyer is a comfortable way to get to and from Boulder. I leaned back in the reclining pilot seat, which sports RTD’s signature 1990s color scheme. Above me were adjustable fan vents and reading lights. Passengers have access to electrical outlets and USB ports. The inside of the coach does feel more like a train than a bus. I thought getting on the highway from downtown Denver would be a bit stop-and-go, but it wasn’t, because the bus has its own ramp, no cars allowed. But that was the last time the Flyer had its own right of way. We traveled in the U.S. 36 express lane with other cars, and on this day there wasn’t any congestion heading west. If the express lane gets clogged, the plan was for buses to cross two lanes of traffic and drive in the shoulder, but it turns out that’s illegal and requires a legislative fix. Twenty-two minutes after leaving we arrived at McCaslin Station. One of six new “BRT” stations, McCaslin’s proximity to the highway meant pulling in and out took just a few seconds. It was quick. At Table Mesa Station, though, some turns and a traffic light made the stop clunkier. As the Flyer hit Broadway in downtown Boulder, the lack of a dedicated lane and bus priority at traffic lights meant a slower ride. Still, we reached Downtown Boulder in 42 minutes — four minutes ahead of schedule. Once people start paying fares, that will probably eat up a few more minutes. I hopped on the 5:10 FF2 back to Denver as congestion began to build. We merged into idle traffic after stopping at Broadway-Euclid, but hopped into the express lane and didn’t see any congestion the rest of the trip — until we hit Park Avenue in Denver. Again, traffic lights and no dedicated lane meant a slow procession into downtown. We arrived 55 minutes after leaving Boulder, which was right on schedule but significantly longer than the trip west. So what’s the verdict? The bus-only ramp, express lane on the highway, and streamlined stops should shave a few minutes off the old run times. Combined with the increases in frequency, the Flatiron Flyer will make bus trips faster and more reliable. The old routes had about 11,000 daily passengers, and that number should climb as the new service lures some people to leave their cars at home. As for showing Denver what BRT is all about — that’s not what this project does. To make buses a first-rate travel option inside the city, we’ll need to change our surface streets too. Denver needs to claim that space from cars and give it to transit riders. 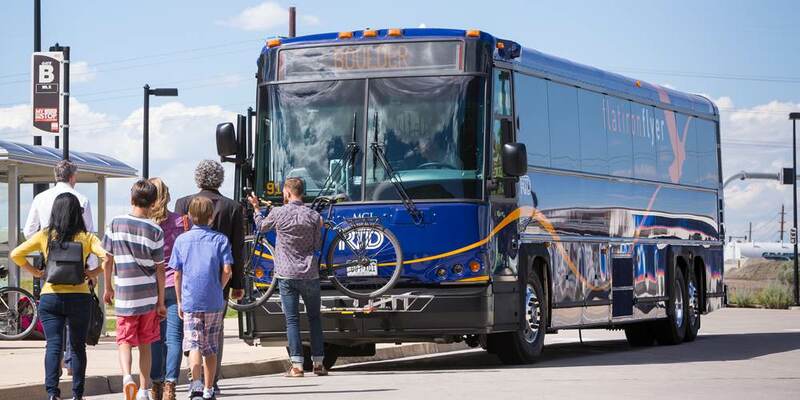 I was one of the few people to go to a town hall meeting regarding the Flatiron Flyer in which I was promised a “completely new experience” in the bus, which I ride daily. Among the promises again were the ability to ride on the shoulder in slow traffic as well as outlets to help commuters stay connected while they ride and they made no mention of changes to the bus stops, even though late in the game as far as process goes. I am not extremely impressed. Since RTD introduced the new buses, I have seen an outlet on the bus twice (and have only been able to locate them in one place on the bus). Additionally, the problem of driving on the shoulders has not been resolved, and I found that one of my frequent stops had been eliminated and the other “temporarily relocated” with only a vague (and long) estimate of when the stop would be available. Additionally, the higher platform makes boarding and exiting the bus slow, clunky and single-file, all of which hinders speed for the Flyer. All in all, I agree: this is an improvement, but a far cry from the BRT ease promised by RTD. I also went to a town hall meeting about 4 years ago where Phil Washington promised a “Gold” standard as defined by ITDP. There was also a rep from ITDP there, showing videos and powerpoints of the real BRTs at Curitiba, LA, and Bogata. This was at the same time the Northwest Rail line to Boulder was basically being canceled and BRT was being offered up as an alternative. As anyone who was following Fasttraks before knew, the HOA lane improvements to the 36 corrider were already in progress. The “BRT” label was just slapped on the exsiting project in an attemt to distract from the PR nightmare of the canceled NW rail line. As David points out and his link to the ITDP scorecard shows, the Flyer is not BRT. That being said, it is an improvement, particularly the more frequent headways. I reverse commute from Denver to Broomfield at odd hours and the minium of 15 minute headways is a big plus. The Flyer, combined with the new 36 Bikeway along with the A line when it opens will make my commute time very close to driving. Of course, the express fare to Broomfileld was elmininated and is now regional, so there is also a fare increase. Absolutely. As one of the people running for RTD Director for District I, I do. Judy Lubow, however, voted for a bonding measure that would inhibit our ability to finance the rail up to Longmont under the existing financial restrictions. I grow more upset with the Flatiron Flyer every day. First, voters were misled by RTD into believing a BRT would be built. What we got is a plain old bus painted a different color – no rapid loading/unloading; no advance ticketing; no dedicated lanes. Buses still sit in traffic, schedules seem erratic, and some FF routes are under-served. Second, the transition to the new FF service has been very problematic. I’ve stood in huge lines that I presume are due to reduced service frequency & seating capacity; and several recent bus trips have had standing room only. While this was an occasional occurrence, it now seems to be the new normal. I give RTD a grade of C- on the implementation of the new service. I give them an F on the down grade from commuter rail, to BRT, and ultimately, to a regular bus line. If RTD does not get its act together soon, like within the next couple months, the metro’s northwest cities and counties need to take independent action. RTD has worked on this route for YEARS, and this is what we got? This is a nice proof that money should never be wasted on hyped-up claims of “BRT”. Demand that RTD build Northwest Rail and demand your money back for the “BRT”.